Curry Gravy is one of the easiest and quickest sauces to prepare. 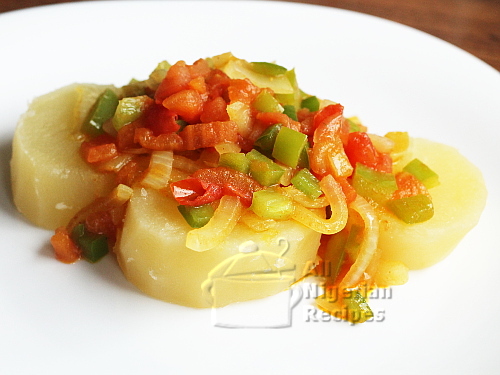 It is the perfect match for Boiled Yam and Boiled Potatoes. Though this does not look anything like a traditional gravy, it is what we called it in my home when I was growing up. Cut the onions into thin quarter slices. Remove the seeds from the tomatoes and cut them in the same manner as the onions. Cut the green pepper into tiny pieces. Pour the vegetable oil into a clean dry pot and let it heat up. Add the tomatoes and fry for another 2 minutes. Add the green pepper and stir for about half a minute. Crush the stock cube and add to the rest of the ingredients. Add ground pepper, curry powder and salt to taste. Stir very well and add a few drops of water. Cover and leave to simmer for one minute. That's it! Curry gravy is perfect for boiled potatoes (Irish or sweet potatoes) and Boiled White Yam.